He's the Jolly Old Elf in a red suit! They are BIG Green Men from Mars with an even BIGGER robot! Before Tim Burton's The Nightmare Before Christmas, they were the ingredients for the weirdest Christmas movie ever! 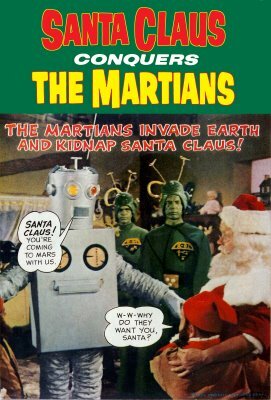 Santa Claus Conquers the Martians was filmed in 1964 in that bastion of the cinema, Long Island (in an unused aircraft hangar). Starring a host of tv and b-movie actors including handsome-but-stiff Leonard Hicks as the Martian Leader (and kids' father) Kimar, villain/voiceover artist Vincent Beck (who did lots of work for Irwin Allen's 1960s sci-fi shows) as the film's mustache-twirling villain, Voldar, and John Call as a pretty damn convincing Santa Claus. As an example of low-budget filmmaking, it's actually pretty effective. Every penny (what few of them they had) is up on the screen. There's lots of stock footage (from Dr. Strangelove, no less). And the use of the then-popular Wham-O Air Blaster toy guns as Martian weapons was either a stroke of marketing genius or clever use of limited funds. Either way, sales of the guns shot thru the roof after the film hit the kiddie matinee circuit! If you're between 3-9 years old, the flick's a lot of fun. If you're between 10 and whatever the local drinking age is, it'll drive you nuts, especially the theme song! If you're over the local drinking age, do so before watching! The flick is available on a host of public domain dvds as well as one of the Mystery Science Theatre 3000 snarkfests (see below). And you just knew we at Atomic Kommie Comics™ were going to include Santa Claus Conquers the Martians in our Cool Christmas collection on stuff including kid and adult sweatshirts and hoodies, mugs and coasters, tree ornaments, stockings, and greeting cards! BTW: The image is from the comic book tie-in. There was also a 45 single of the theme, a spoken-word LP album of the movie's dialogue, and a novelization! Now I can't get that frackin' theme out of my head..."Hoo-ray for Santy Claus..." AARRRGGGHHH! If they sing that damn theme song...AGAIN, you're dead! FREE early Christmas gift from us to you: a link to a download of the film in various formats! EXTRA free early Christmas gift from us to you: a link to an on-line reprint of the comic book adaptation of the film!